Please join us in marking 20 years since the signing of the Dayton Peace Accords which ended the ethnic cleansing and genocide in Bosnia and Herzegovina. The peace negotiations - led by the late U.S. diplomat Richard Holbrooke, were finalized in Dayton, Ohio on November 21, 1995 at the Wright-Patterson Air Force Base and formally signed in Paris, France on December 14, 1995. 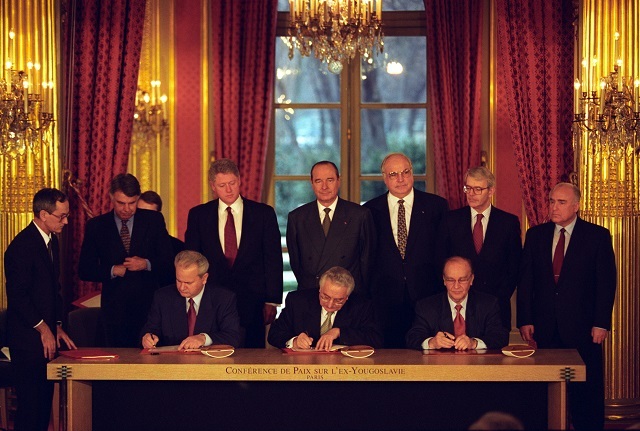 While the Dayton Pace Accords stopped the war that took over 100,000 lives, displaced over 2 million people and left between 20,000 to 50,000 Bosniak women and girls victims of sexual violence, it also gave Bosnia and Herzegovina a complex two-entity system of governance - the Federation of Bosnia and Herzegovina and Republika Srpska. Twenty years after the signing of the Dayton Peace Accords, Bosnia and Herzegovina is striving to move forward despite obstacles that were created by the very peace agreement that stopped the war. Today, Bosnia's smaller entity - Republika Srpska, continues to threaten the agreement as corruption, hateful political rhetoric, and a weak economy eat away at the progress that was made. Despite the immense challenges, there has been no renewed violence, however, there is a renewed sense of uncertainty as certain political elites continue to perpetuate an atmosphere of fear and hate among various ethnic groups. The distinguished speakers will discuss the positive progress that has been made over the last two decades, lessons learned and highlight the challenges that remain twenty years after the signing of the Dayton Peace Accords.